For the National Football League team that played in the city of St. Louis from 1960 to 1987, see History of the St. Louis Cardinals (NFL). The St. Louis Cardinals are an American professional baseball team based in St. Louis, Missouri. The Cardinals compete in Major League Baseball (MLB) as a member club of the National League (NL) Central division. Busch Stadium has been their home ballpark since 2006. One of the most successful franchises in baseball history, the Cardinals have won 11 World Series championships, the second-most in Major League Baseball (behind the New York Yankees) and the most in the National League. Their 19 National League pennants rank third in NL history. In addition, St. Louis has won 13 division titles in the East and Central divisions. While still in the old American Association (AA), named then as the St. Louis Browns, the team won four AA league championships, qualifying them to play in the professional baseball championship tournament (a forerunner of the modern World Series, established 1903) of that era. They tied in 1885 and won outright in 1886 and lost in 1888 for the early trophy Hall Cup versus the New York Giants. The others both times against the Chicago Cubs (originally the Chicago White Stockings then), in the first meetings of the Cardinals–Cubs rivalry between nearby cities of St. Louis and Chicago that continues to this day. With origins as one of the early professional baseball clubs in St. Louis and the nation, entrepreneur Chris von der Ahe purchased a barnstorming club in 1881, then known as the Brown Stockings, and established them as charter members of the old American Association (AA) base ball league which played 1882 to 1891, the following season. Upon the discontinuation of the AA, St. Louis joined the continuing National League of Professional Base Ball Clubs, later known simply as the National League, (organized in 1876), in 1892; at that time, they were called the Browns (not to be confused with a later team also known as the St. Louis Browns in the American League, 1902-1953) and also as the Perfectos before they were officially renamed eight years later as the Cardinals in 1900. Cardinals achievements that have impacted MLB and sports events in general include manager/owner Branch Rickey's pioneering of the farm system, Rogers Hornsby's two batting Triple Crowns, Dizzy Dean's 30-win season in 1934, Stan Musial's 17 MLB and 29 NL records, Bob Gibson's 1.12 earned run average (ERA) in 1968, Whitey Herzog's Whiteyball, Mark McGwire breaking the single-season home run record in 1998, and the 2011 championship team's unprecedented comebacks. The Cardinals have won 105 or more games in four different seasons and won 100 or more a total of nine times. Cardinals players have won 20 league MVPs, four batting Triple Crowns, and three Cy Young Awards. Baseball Hall of Fame inductees include Lou Brock, Dizzy Dean, Bob Gibson, Whitey Herzog, Rogers Hornsby, Joe Medwick, Stan Musial, Branch Rickey, Red Schoendienst, Ozzie Smith, and Bruce Sutter. In 2018, Forbes valued the Cardinals at $1.9 billion, making them the 7th-most valuable franchise in MLB; their revenue the previous year was $319 million, and their operating income was $40.0 million. Since their purchase in 1995, owner William DeWitt, Jr.'s investment group has seen enormous growth from the $147 million purchase price. John Mozeliak is the President of Baseball Operations, Mike Girsch is the general manager and Mike Shildt is the manager. The Cardinals are renowned for their strong fan support: despite being in one of the sport's mid-level markets, they routinely see attendances among the league's highest, and are consistently among the Top 3 in MLB in local television ratings. Professional baseball began in St. Louis with the inception of the Brown Stockings in the National Association (NA) in 1875. The NA folded following that season, and the next season, St. Louis joined the National League as a charter member, finishing in third place at 45-19. George Bradley hurled the first no-hitter in Major League history. The NL expelled St. Louis from the league after 1877 due to a game-fixing scandal and the team went bankrupt. Without a league, they continued play as a semi-professional barnstorming team through 1881. Charles Comiskey, shown here circa 1910, guided the Browns to four American Association titles. The next season, St. Louis shortened their name to the Browns. Soon thereafter they became the dominant team in the AA, as manager Charlie Comiskey guided St. Louis to four pennants in a row from 1885 to 1888. Pitcher and outfielder Bob Caruthers led the league in ERA (2.07) and wins (40) in 1885 and finished in the top six in both in each of the following two seasons. He also led the AA in OBP (.448) and OPS (.974) in 1886 and finished fourth in batting average in 1886 (.334) and fifth in 1887 (.357). Outfielder Tip O'Neill won the first batting triple crown in franchise history in 1887 and the only one in AA history. By winning the pennant, the Browns played the NL pennant winner in a predecessor of the World Series. The Browns twice met the Chicago White Stockings – the Chicago Cubs prototype – tying one in a heated dispute and winning the other, thus spurring the vigorous St. Louis-Chicago rivalry that ensues to this day. During the franchise's ten seasons in the AA, they compiled an all-time league-high of 780 wins and .639 winning percentage. They lost just 432 contests while tying 21 others. Rogers Hornsby won two Triple Crowns as a Cardinal. The AA went bankrupt after the 1891 season and the Browns transferred to the National League. This time, the club entered an era of stark futility. Between 1892 and 1919, St. Louis managed just five winning seasons, finished in last or next-to-last place sixteen times, and ended four seasons with 100 losses or more. The nadir was the 1897 season: a 29–102 record for a franchise-worst .221 winning percentage. St. Louis' 84-67 finish as the Perfectos would be the team's best finish between the AA era and Sam Breadon's purchase of the team. As the "Perfectos", the team wore their jersey with a cardinal red trim and sock striping. Later that season, St. Louis Republic sportswriter Willie McHale included an account in a column of a female fan he heard remarking about the uniforms, "What a lovely shade of cardinal." Fans liked the moniker "Cardinals" and, the next year, popularity for the nickname induced an official change to Cardinals. In 1902, an American League team moved from Milwaukee into St. Louis, renamed themselves the St. Louis Browns and built a new park on the site of the Cardinals' old stadium, striking a rivalry that lasted five decades. Breadon bought a minority interest in the Cardinals in 1917 and in 1919 Browns manager Branch Rickey joined the Cardinals. The Cardinals' first 28 seasons in the NL were a complete reversal of their stay in the AA – with a .406 winning percentage, they compiled 1,632 wins, 2,425 losses and 74 ties. St. Louis baseball commenced a renaissance: since 1926 the Cardinals have won eleven World Series and nineteen NL pennants. Breadon spurred this revival when bought out the majority stake in 1920 and appointed Rickey as business manager, who expanded scouting, player development, and pioneered the minor league farm system, filling the role of today's general manager. With Rogers Hornsby at second base, he claimed Triple Crowns in 1922 and 1925, and the Cardinals won the 1926 World Series, their first. St. Louis then won the league in 1928, 1930, and 1931 and the 1931 World Series. Stan Musial retired owning numerous National League and team batting records. The Gashouse Gang edition claimed the 1934 World Series and the Cardinals amassed new thresholds of popularity far outside St. Louis via radio, which led to the coining of the term "Cardinal Nation". Dizzy Dean led the Gang, winning the 1934 MVP, and leading the NL multiple times in wins, strikeouts, innings, complete games and shutouts. Johnny Mize and Joe Medwick emerged as two power threats, with Medwick claiming the last Triple Crown for a Cardinal in 1937. In the 1940s, a golden era emerged as Rickey's farm system became laden with such talent as Marty Marion, Enos Slaughter, Mort Cooper, Walker Cooper, Stan Musial, Max Lanier, Whitey Kurowski, Red Schoendienst and Johnny Beazley. It was one of the most successful decades in franchise history with 960 wins 580 losses for a winning percentage higher than any other Major League team at .623. With Billy Southworth managing, they won the World Series in 1942 and 1944 (in the only all-St. Louis series against the Browns), and won 105 or more games each in 1942, 1943, and 1944. Southworth's managerial winning percentage (.642) is St. Louis' highest since the franchise joined the National League. Musial was considered the most consistent hitter of his era and most accomplished in team history, winning three MVPs and seven batting titles. St. Louis then won the 1946 World Series on Slaughter's Mad Dash in Game 7. Breadon was forced to sell the team in 1947 but won six World Series and nine NL pennants as Cardinals owner. They remained competitive, finishing .500 or better in thirteen of the next seventeen seasons, but fell short of winning the league or World Series until 1964. Bob Gibson, the most decorated pitcher in team history, won two Cy Young Awards. In 1953 the Anheuser-Busch brewery bought the Cardinals and August "Gussie" Busch became team president, spurring the Browns' departure in 1953 to Baltimore to become the Orioles, and making the Cardinals the only major league club in town. More success followed in the 1960s, starting with what is considered one of the most lopsided trades in Major League history, as St. Louis received outfielder Lou Brock from the Cubs for pitcher Ernie Broglio. MVP third baseman Ken Boyer and pitcher Bob Gibson led the club to a World Series win the same year and Curt Flood, Bill White, Curt Simmons, and Steve Carlton also made key contributions in this decade. In 1967, new arrival Orlando Cepeda won the MVP, helping to propel St. Louis to the World Series. The Cardinals won the league the following year behind their Major League-leading 2.49 staff ERA in what was an all-round record-breaking season of pitching dominance. Posting a modern-day record low ERA of 1.12 and striking out a one-game World Series-record of 17, Gibson won both the MVP and Cy Young awards that year. However, the Cardinals failed to repeat as World Series champions, blowing a 3-1 lead to the underdog Detroit Tigers. In the 1970s, catcher/third baseman Joe Torre and first baseman Keith Hernández each won MVPs, but the team's best finishes were second place and 90 wins. The team found their way back to the World Series the next decade, starting with manager Whitey Herzog and his Whiteyball style of play and another trade that altered course of the franchise: in 1982, shortstop Garry Templeton was shipped to the Padres for fellow shortstop Ozzie Smith. Widely regarded as one of the best defensive players in history, Smith ranks first all-time among shortstops in Gold Glove Awards (13), All-Star games (15), assists (8,375), and double plays (1,590). St. Louis won the 1982 World Series from the Milwaukee Brewers that fall. The Cardinals again won the league in 1985 and 1987. In the 1985 Series, they faced-off with cross-state rivals Kansas City Royals for the first time in a non-exhibition game, but they lost the series. Pitcher Chris Carpenter, essential in two World Series titles, won 10 playoff games with a 3.00 postseason ERA. Albert Pujols is one of the most accomplished players in Cardinals' history. After Gussie Busch died in 1989, the brewery took control and hired Joe Torre to manage late in 1990, then sold the team to an investment group led by William DeWitt, Jr. in 1996. Tony La Russa replaced Torre in the spring of 1996. In 1998, Mark McGwire competed with the Cubs' Sammy Sosa for a barrage of home runs in their pursuit of the single-season home run record. From 2000 to 2013, the Cardinals reestablished their way to the top with ten playoff appearances, four NL pennants, two World Series titles and 1,274 regular season wins against 993 losses for a .560 winning percentage, leading the National League and second in MLB only to the New York Yankees. With the addition of Jim Edmonds, Albert Pujols, and Scott Rolen, the Cardinals featured three prominent sluggers and defenders nicknamed "MV3;" Pujols won three MVPs and hit .328 with 445 home runs in his Cardinals career. In 2004, playoff stalwart Chris Carpenter's 3.09 ERA and 15 wins helped power the team to a major-league best 105 wins and take the NL pennant. In 2006, beset with injuries and inconsistency, they won the World Series, beating Detroit in five games to set an all-time record-low of 83 wins for a World Series winner. In 2009, the Cardinals reached 10,000 wins, dating to when they first played in the American Association (AA). [d] St. Louis returned to the playoffs in 2011, first surmounting the largest games-won deficit after 130 games (at 10.5) to upstage the Atlanta Braves on the final day for the wild card playoff berth. In Game 3 of the World Series, Pujols became just the third player to hit three home runs in a World Series game. In Game 6, third baseman David Freese and outfielder Lance Berkman each tied the score on the Cardinals' final strike – the first such occurrence in any game in MLB history – and St. Louis defeated the Texas Rangers later that game with a walk-off home run from Freese. After winning that Series, La Russa retired and became the only manager to do so after winning a title. He also finished with the most wins for managers in franchise history with 1,408. La Russa's successor, Mike Matheny, helped extend St. Louis' playoff run as he became the first manager in the division play era to guide the Cardinals to the NLCS and playoffs in his first two seasons. In 2014, the Cardinals extended their NLCS streak to 4, with their 3-1 series victory over the Dodgers, in the NLDS. Ten days after being eliminated from the postseason by the San Francisco Giants, rookie outfielder Oscar Taveras was killed in a car accident while traveling to his hometown Puerto Plata in the Dominican Republic. On November 17, they acquired Atlanta Braves right-fielder Jason Heyward (who had just come off a Gold Glove-winning season) to replace Taveras. On June 16, 2015, the FBI and the Justice Department started an investigation on the Cardinals for possibly hacking the Houston Astros. The hacking incident was perpetrated by Scouting Director Chris Correa. For the first time since the 2007–2008 seasons, the Cardinals missed the playoffs in consecutive years, 2016–2017. On July 14, 2018 following an 8-2 loss to the Cincinnati Reds, the St. Louis Cardinals announced they had dismissed manager Mike Matheny after 6 and a half seasons as team skipper. They named Mike Shildt interim manager and eventually manager. 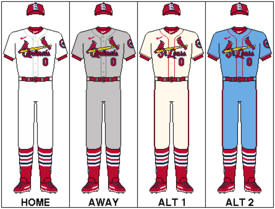 On November 19, 2018, the team announced the "Victory Blue" uniforms worn by the Cardinals during the late 1970s and 1980s would be returning for the 2019 season. The uniforms, integrating the powder blue color with the team's current "Saturday alternate" jersey design, will be worn thirteen times on the road during the 2019 season. The Cardinals acquired Paul Goldschmidt in a trade from the Arizona Diamondbacks on December 5, 2018. The Cardinals play their home games at Busch Stadium (also referred to as New Busch Stadium or Busch III) in downtown St. Louis, straddling 7th and Clark near the intersection of Interstates 64 and 70. The stadium opened for the 2006 season at a cost of $411 million and holds a normal capacity of 46,861. The Cardinals finished their inaugural season in the new Busch Stadium by winning the 2006 World Series, the first team since the 1923 New York Yankees to do so. This open-air stadium emulates the HOK Sport (now Populous)-designed "retro-style" baseball-only parks built since the 1990s. The open panoramic perspective over the outfield wall offers a remarkable view of St. Louis' downtown skyline featuring the distinctive Gateway Arch. A replica of Eads Bridge spans the entrance to the park on the third base side, while the statue of Stan Musial arises in front of that entrance. Other statues at the corner of 8th and Clark include Hall of Famers Rogers Hornsby, Ozzie Smith, George Sisler, Cool Papa Bell, Bob Gibson, Jack Buck and others. Due to increased demand, Game 7 of the 2011 World Series accommodated a baseball record of 47,399 by increasing the number of standing room only tickets. The attendance record for any sporting event is 48,263, in a 2013 Association Football (soccer) friendly match between Chelsea F.C. and Manchester City F.C., made possible by on field seating. The largest attendance (53,000) of any event at Busch belongs to U2 during a concert from their 360° Tour in 2011. Ballpark Village, a mixed-use development located across Clark Street from Busch Stadium, is targeted to enhance the ballpark goers' experience. [citation needed] Phase 1 of the development, completed for the start of the 2014 season, includes entertainment venues, restaurants, and retail. Anchored by Cardinals Nation (which includes the Cardinals Hall of Fame, a two-story Cardinals-themed restaurant and rooftop seating for 300+ fans with views of the field across the street), a 20,000 sq ft Budweiser Brew House, FOX Sports Midwest Live! and PBR, the $100 million phase 1 development of Ballpark Village is intended to be a gathering space throughout the year, not just during the baseball season. Busch Stadium is the Cardinals' fourth home ballpark and the third to bear that name. The Cardinals' original home ballpark was Sportsman's Park from 1882 to 1892 when they played in the American Association and were known as the Browns. In 1893, the Browns moved to a new ballpark five blocks northwest of Sportsman's Park which would serve as their home from 1893 to 1920. The new park was originally called New Sportsman's Park but became more commonly referred to as Robison Field. Midway through the 1920 season the Cardinals abandoned Robison Field and returned to the original Sportsman's Park and became tenants of their American League rivals, the St. Louis Browns. In 1953, the Anheuser-Busch Brewery purchased the Cardinals and the new owner subsequently also purchased Sportsman's Park from the Browns and renamed it Busch Stadium, later becoming Busch I. The Browns then left St. Louis for Baltimore after the season. The Cardinals built Busch Memorial Stadium, or Busch II, in downtown St. Louis, opened it during the 1966 season and played there until 2005. It was built as the multi-purpose stadium home of both the baseball Cardinals and the NFL football Cardinals, who are now the Arizona Cardinals. The current Busch Stadium was constructed adjacent to, and partly atop, the site of Busch Memorial Stadium. The Cardinals home field in spring training is Roger Dean Stadium in Jupiter, Florida. They share the complex, which opened in 1998, with the Miami Marlins. Before moving to Jupiter, the Cardinals hosted spring training at Al Lang Field in St. Petersburg, Florida from 1937 to 1997. The Cardinals have had few logos throughout their history, although those logos have evolved over time. The first logo associated with the Cardinals was an interlocking "SL" that appeared on the team's caps and or sleeves as early as 1900. Those early uniforms usually featured the name "St. Louis" on white home and gray road uniforms which both had cardinal red accents. In 1920, the "SL" largely disappeared from the team's uniforms, and for the next 20 years the team wore caps that were white with red striping and a red bill. In 1922, the Cardinals wore uniforms for the first time that featured the two familiar cardinal birds perched on a baseball bat over the name "Cardinals" with the letter "C" of the word hooked over the bat. The concept of the birds originated after general manager Branch Rickey noticed a colorful cardboard arrangement featuring cardinal birds on a table in a Presbyterian church in Ferguson, Missouri, at which he was speaking. The arrangement's production was by a woman named Allie May Schmidt. Schmidt's father, a graphic designer, helped Ricky make the logo a familiar staple on Cardinals uniforms. Colloquially referred to as the "birds on the bat", it initially appeared with the birds perched on a black bat and "Cardinals" in printed letters. An alternate version of this logo with "St. Louis" replacing "Cardinals" appeared in 1930 and was the primary logo in 1931 and 1932 before "Cardinals" returned. In 1940, the now-familiar "StL" logo was introduced on the team's caps. The interlocking "StL" has undergone several slight modifications over the years but has appeared on the team's caps every year since. The first appearance of the "STL" in 1940 coincided with the introduction of navy blue as a uniform color. From 1940 until 1955, the team wore navy blue caps with red bills and a red interlocking "StL" while the jerseys featured both cardinal red and navy blue accents. In 1951, the "birds on the bat" logo was changed to feature a yellow baseball bat. In 1956, the Cardinals changed their caps to solid blue with a red "StL", removing the red bill. Also, for that season only, the Cardinals wore a script "Cardinals" wordmark on their uniforms excluding the "birds on the bat." An updated version of the "birds on the bat" logo returned in 1957 with the word "Cardinals" written in cursive beneath the bat. In 1962, the Cardinals became the first National League team to display players' names on the back of their jerseys. In 1964, while retaining their blue caps for road games, the Cardinals changed their home caps to all red with a white interlocking "StL". The next year, the red caps were the only cap worn by the team full-time. In 1967, the birds on the bat emblem on the jersey was again tweaked, making the birds more realistic and changing the position of their tails relative to the bat and this version remained on all Cardinals game jerseys through 1997. On November 16, 2012, the Cardinals unveiled a new alternate uniform to be worn at home games on Saturdays beginning with the 2013 season. [needs update] The modified jersey, cream-colored with red trim on the sleeves and down the front, was the first since 1932 in which "St. Louis" will be used instead of "Cardinals" and retained the "birds on the bat." 2013 also saw the team adopt their red caps as their main uniform for both home and away games; the navy cap was retained as an alternate, used mainly against other red-capped teams. Over the years, the Cardinals have released various marketing logos depicting anthropomorphized cardinals in a pitching stance, swinging a baseball bat, or wearing a baseball cap that never became part of the game uniform. The team mascot is an anthropomorphic cardinal wearing the team's uniform named Fredbird. He is assisted by Team Fredbird, a group of eleven women who entertain fans from the field and on top of the dugouts. While unofficial, the Rally Squirrel became an unexpected phenomenon during the 2011 postseason. Making its "debut" in Game 3 of the NLDS on Oct 4, a squirrel ran across home plate in the middle of a pitch from Roy Oswalt of the Phillies to the Cardinals' Skip Schumaker. The Cardinals would win Game 4 and subsequently Game 5 (October 7) in Philadelphia to advance to the NLCS, symbolizing the squirrel's "role" in the victory. The squirrel was popularized as "Buschie the Rally Squirrel" As a tribute to the popularity of the squirrel, a small depiction of the Rally Squirrel is also included on the official World Series rings the team received. It shows up under the "STL" logo on the side of the ring. The Cardinals–Cubs rivalry refers to games between the Cardinals and the Chicago Cubs. The rivalry is also known as the Downstate Illinois rivalry or the I-55 Series (in earlier years as the Route 66 Series) as both cities are located along Interstate 55 (which itself succeeded the famous U.S. Route 66). The Cubs lead the series 1,134–1,103 through June 22, 2016, while the Cardinals lead in National League pennants with 19 against the Cubs' 17. The Cubs have won 11 of those pennants in Major League Baseball's Modern Era (1901–present), while all 19 of the Cardinals' pennants have been won since 1926. The Cardinals also have an edge when it comes to World Series successes, having won 11 championships to the Cubs' 3. Games featuring the Cardinals and Cubs see numerous visiting fans in either Busch Stadium in St. Louis or Wrigley Field in Chicago. When the National League split into two and then three divisions, the Cardinals and Cubs remained together. This has added excitement to several pennant races over the years. The Cardinals and Cubs have played each other once in the postseason, when the Cubs beat the Cardinals 3 games to 1 in the 2015 National League Division Series. An investment group led by William DeWitt, Jr. owns the St. Louis Cardinals, having bought the team from Anheuser-Busch (AB) in 1996. As with other periods of the Cardinals' transaction history, doubt loomed as to whether the purchaser would keep the team in St. Louis, due to the city's status as a "small market", which appears to handicap a club's competitiveness. Such was the case when Sam Breadon put the Cardinals up for sale in 1947: then-NL President Ford Frick proposed moving the Cardinals to Chicago. When AB placed the Cardinals for sale in 1995, they publicly expressed intention to find a buyer who would keep the club in St. Louis. In March 1996, AB sold the team for $147 million to a partnership headed by Southwest Bank's Drew Baur, Hanser and DeWitt, Jr. Civic Center Redevelopment, a subsidiary of AB, held the parking garages and adjacent property and also transferred them to the Baur ownership group. Baur's group then sold the garages to another investment group, lowering the net franchise purchase price to about $100 million, about $10 million less than Financial World's value of the team at the time $110 million. Current Cincinnati Reds owners Bob Castellini and brothers Thomas Williams and W. Joseph Williams Jr. each once owned a stake in the Cardinals dating back to the Baur-DeWitt group's purchase of the team. To allow their purchase of the Reds in 2005, the rest of the group bought out Castellini's and the Williams brothers' shares, totaling an estimated thirteen percent. At that time, the Forbes valued the Cardinals at about $370 million. However, after reabsorbing that stake into the remainder of the group, they decided to make it available to new investors in 2010. Amid later allegations that the Cardinals owed the city profit shares, DeWitt revealed that their profitability had not reached the threshold to trigger that obligation. As of 2018, Forbes valued the Cardinals seventh among 30 MLB franchises. Their estimated value of $1.90 billion was an increase of $100 million from the season before, when they ranked seventh. St. Louis' revenue in 2018 was $319 million, up $9 million. Their Operating income was $40.0 million. The Cardinals' deal with Fox Sports Midwest, signed in 2015, begins in 2018, and is worth $1 billion through 2032. In 2014, Forbes valued the Cardinals at $820 million and opined previously that they play "in the best single-team baseball market in the country and are among the league's leaders in television ratings and attendance every season." Concurrent with the growth of Major League Baseball, the Cardinals value has increased significantly since the Baur-DeWitt purchase. In 2000, the franchise was valued at $219 million, a growth rate of 374% through 2014. The franchise's value grew 12.7% from 2013 to 2014. The Forbes methodology of team values are enterprise values (equity plus net debt) that include the economics of the ballpark but exclude the value of real estate itself. Forbes does not include the value of team-owned regional sports networks. The league's ownership in Major League Baseball Advanced Media (100%) and the MLB Network (67%) and league's investment portfolio are included in our values. In total, these three assets constitute about $425 million in value for each team. Revenue and operating income (earnings before interest, taxes, depreciation and amortization) measure cash in versus cash out (not accrual accounting) for the 2017 season. Their figures include the post-season and are net of revenue sharing and stadium debt payments. Revenues include the pro-rated upfront bonuses networks pay teams as well as proceeds from non-MLB events at the ballpark. The non-recurring $18 million each team received in 2017 from the sale of a stake in BamTech to Walt Disney was excluded, as were profits or losses from team-owned RSNs. Owner, Chairman and CEO: William DeWitt, Jr.
Field managers with one or more years managing, and the current manager are included here. Darryl Kile Award: Two awards are presented each year, one to a St. Louis Cardinal and one to a Houston Astro, each of whom exemplifies Kile's virtues of being "a good teammate, a great friend, a fine father and a humble man." The winner is selected by each local chapter of the Baseball Writers' Association of America. See: St. Louis Cardinals award winners and league leaders § Darryl Kile Good Guy Award. No-hitters: Cardinal pitchers have thrown 10 no-hitters: Ted Breitenstein (1891), Jesse Haines (1924), Paul Dean (1934), Lon Warneke (1941), Ray Washburn (1968), Bob Gibson (1971), Bob Forsch (1978 and 1983), José Jiménez (1999), and Bud Smith (2001). The Cardinals have never been involved in a perfect game, win or lose. Cy Young Awards: Two Cardinal pitchers have won Cy Young Awards: Bob Gibson in 1968 and 1970, and Chris Carpenter in 2005. MVP Awards: 16 different Cardinal players have won a total of 20 Most Valuable Player awards, the most recent being Albert Pujols in 2009. Pujols and Stan Musial have collected the most MVPs with three apiece. Bob Gibson won both the Cy Young Award and the MVP award in 1968. The Cardinals are second only to the New York Yankees' 22 MVP awards. Rookie of the Year: Six Cardinals have won the Rookie of the Year award: Wally Moon in 1954, Bill Virdon in 1955, Bake McBride in 1974, Vince Coleman in 1985, Todd Worrell in 1986, and Albert Pujols in 2001. Hitting for the cycle: 20 Cardinal players have hit for the cycle, the most recent being Mark Grudzielanek in 2005. Triple Crown: Four of the 16 batting Triple Crowns in the major leagues (including three of only six in the National League) were by Cardinals. Tip O'Neill won the only American Association Triple Crown and the first in franchise history in 1887. Rogers Hornsby became the only two-time winner in NL history when he did it in 1922 and 1925 (Ted Williams won two AL Triple Crowns). Joe Medwick's Triple Crown in 1937 is the last in the history of the National League. Hornsby's 1925 numbers led the entire major leagues, making him one of only five players to have won this expanded Triple Crown. Home runs and RBI in a game: Jim Bottomley drove in 12 runs against Brooklyn on September 16, 1924, an all-time MLB single-game record that still stands. On September 7, 1993, Mark Whiten tied that record and another MLB single-game record with four home runs. 2 Grand Slams in a single inning: Fernando Tatís is the only player in Major League history to hit two grand slam home runs in the same inning, on April 23, 1999. Both were against Chan Ho Park of the Dodgers. 10 Tony La Russa Manager 1996–2011 Born in Tampa Bay, Florida, won 1 World Series in 1989 as the manager of the Oakland Athletics and 2 with the St. Louis Cardinals in 2006 and 2011. The Cardinals have retired 12 total jersey numbers––second in MLB only to the New York Yankees' 21––in honoring 14 total former players and club personnel on the left field wall at Busch Stadium. A 15th, Jackie Robinson, is honored by all MLB teams. During the time Rogers Hornsby had played, the Cardinals did not have any numbers on their uniforms. This practice had begun with the Cleveland Indians in 1920. Thus, Hornsby had no number to retire. 42: Jackie Robinson's number 42 was retired throughout baseball in 1997. The Cardinals again retired 42 in September 2006 in honor of Sutter, who was elected to the Hall of Fame earlier in the year. 51: Willie McGee's (OF, 1982–1990, 1996–1999; Coach, 2018–present) number has not been reissued since late in the 2001 season. McGee became a coach on the Cardinals' staff in the 2018 season and was reissued the number. 57: Darryl Kile's (P, 2000–02) number has not been reissued since his death in the middle of the 2002 season. Along with Josh Hancock's number 32, another active pitcher deceased in the middle of the season, they are honored with small circular logos bearing their initials and numbers on the wall of the Cardinal bullpen. During the 2014 playoffs, but following the Cardinals' elimination, rookie and star prospect Oscar Taveras was killed in a car accident. His number 18 was added along with Kile's and Hancock's in the home bullpen; however, his number was reissued the following season to close friend Carlos Martinez. Capable of reaching 21 million listeners in nine states including Missouri, Illinois, Arkansas, Indiana, Iowa, Kentucky, Mississippi, Oklahoma, and Tennessee, the Cardinals radio network is the second-largest in MLB with 117 affiliate stations. In St. Louis, CBS-owned KMOX (1120 AM) airs Cardinals games over radio and feeds the rest of the Cardinals network. Mike Shannon and John Rooney alternate as play-by-play announcers, with Chris Hrabe serving as pre-game and post-game host. KMOX's 50,000-watt clear-channel signal covers much of the continental United States at night. At one time, owing to the Cardinals' status as a "regional" franchise, the Cardinals radio network reached almost half of the country. The 2011 season marked the Cardinals' return to KMOX following five seasons on KTRS (550 AM), a station which is 50 percent owned by the Cardinals. With a partnership spanning seven decades, and continuously since 1954, its conclusion was realized after the 2005 season when CBS Radio and the Cardinals failed to reach terms on a new rights agreement. However, frustrated by the underpowered coverage of 5,000-watt KTRS, the Cardinals reached a new deal with KMOX in 2011. Mike Shannon announced 30 fewer games in 2013, compared to the 15 he took off in 2012, and in previous seasons. Most of the games will be road games and three-city trips. He has been announcing Cardinals' games starting in 1972, making 2013 his 41st year announcing. He turns 74 in July. He has announced Cardinals' games for more years than anyone except Jack Buck (1954–58, 1961–2001) who announced for 46 years. Since 2000, Cardinals telecasts have generated the top three in ratings in MLB every season. Fox Sports Midwest airs all games in high-definition and is the team's exclusive television broadcaster, with the exception of selected Saturday afternoon games on Fox (via its St. Louis affiliate, KTVI) or Sunday Night Baseball on ESPN. Fox Sports Indiana, Fox Sports South, Fox Sports Tennessee, Fox Sports Oklahoma, Fox Sports Southwest, and SportSouth air Cardinals games for fans living within the Cardinals broadcast territory who do not receive the Fox Sports Midwest channel. During the 2016 season, the Cardinals averaged an 8.54 rating and 104,000 viewers on primetime TV broadcasts in St Louis. The television commentators lineup includes Dan McLaughlin, Rick Horton, and Al Hrabosky. Jimmy "The Cat" Hayes serves as dugout reporter during the game as well as on Cardinals Live, a pre- and post-game show. Cardinals Live is hosted in-studio by Pat Parris along with game analysts and former Cardinals players Jim Edmonds, Gary Bennett and Chris Duncan. Cardinals Kids, a program aimed at the team's younger fans, airs weekly in-season on Fox Sports Midwest. It's hosted by former Cardinals pitcher Andy Benes, team mascot Fredbird, and Busch Stadium Public Address announcer John "The U-Man" Ulett. The 30-minute show began airing in 2003 and presents team news, player profiles, and Cardinals team history in a kid-friendly manner along with games and trivia. Former Cardinals broadcasters include Jack Buck, Harry Caray, Dizzy Dean, Joe Garagiola, Sr., and Jay Randolph. Joe Buck, the son of Jack Buck, was an official member of the Cardinals' broadcast team from 1991 until 2007. The younger Buck is currently the lead play-by-play caller for Fox Sports' national Major League Baseball and National Football League broadcasts. ^ In 2001, the Cardinals and the Houston Astros finished the season with identical records of 93–69 and finished tied for first place in the Central Division standings. The Baseball Hall of Fame wrote they were both awarded a co-championship. According to the Cardinals' website, this was "the first shared championship in major-league history". For playoff seeding, the NL Central slot went to Houston and St. Louis was awarded the wild card berth. ^ In 1981, the Cardinals finished with the overall best record in the East Division. However, a players' strike in the middle of the season forced the season to be split into two halves. St. Louis finished second in both halves and was thereby deprived of a post-season appearance. ^ Although the St. Louis Cardinals do not officially recognize their era in the American Association (AA) as part of their Major League history, Major League Baseball recognized that incarnation of the AA in 1968, as well as other historic leagues, existing as former Major Leagues. ^ Falk, Jill (October 11, 2016). "New book highlights history of St. Louis Cardinals uniforms and logos". Cardinals.MLBlogs.com. MLB Advanced Media. Retrieved December 2, 2018. ^ Getzenberg, Alaina (September 18, 2017). "Schmidt's vision inspired iconic red bird logo". MLB.com. MLB Advanced Media. Retrieved December 2, 2018. There are few logos in baseball as closely linked to a team as the "Birds on the Bat" is to the Cardinals. The red birds that are now inseparable from the Cardinal name, however, were not featured by the team in its earliest days. Rather, the name originally referred to the color cardinal red. ^ "St. Louis Cardinals and the National Baseball Hall of Fame". National Baseball Hall of Fame and Museum. Archived from the original on June 10, 2007. The Cardinals and Astros were declared co-champions of the NL Central in 2001, based on their identical regular season record. The Astros, who edged the Cardinals in head-to-head games, 9-7, were seeded as the division winner in the post-season, and the Cardinals were seeded as the wild-card. ^ "St. Louis Cardinals History". St. Louis Cardinals. Retrieved October 29, 2011. ^ a b c d e f g h i "St. Louis Cardinals Team History & Encyclopedia". Baseball-Reference.com. Retrieved February 13, 2013. ^ a b c d "St. Louis Cardinals". Forbes. April 11, 2018. Retrieved April 12, 2018. ^ a b c d "St. Louis Cardinals". Forbes. March 23, 2016. ^ a b "St. Louis Cardinals". Forbes. March 2015. ^ a b c d e f g "Cardinals Front Office". mlb.com. Retrieved October 14, 2014. ^ "Cards promote Mozeliak, name Girsch GM". mlb.com. Retrieved July 1, 2017. ^ Saunders, Patrick (August 2, 2012). "Cardinals fans get another vote as best in baseball". The Denver Post. Retrieved July 1, 2016. ^ a b c "Busch Stadium facts". St. Louis Cardinals. Retrieved July 1, 2016. ^ a b "St. Louis Cardinals Team History & Encyclopedia". Baseball Reference. Retrieved October 24, 2014. ^ a b "St. Louis Cardinals (1882–2013)". Retrosheet. Retrieved October 24, 2014. ^ "1875 St. Louis Brown Stockings team page". Baseball-Reference.com. Retrieved January 10, 2013. ^ "Franchise Timeline". The Official Site of the St Louis Cardinals. Major League Baseball. Retrieved October 24, 2014. ^ "Cardinals assert team history began in 1892". The Cardinal Nation Blog. August 21, 2009. Retrieved October 24, 2014. ^ a b "Charlie Comiskey Managerial Record". Baseball-Reference.com. Retrieved March 26, 2013. ^ "Bob Caruthers player page". Baseball-Reference.com. Retrieved April 21, 2013. ^ "Tip O'Neill player page". Baseball-Reference.com. Retrieved April 21, 2013. ^ "Tip O'Neill awards". Baseball Almanac. Retrieved April 21, 2013. ^ a b c d "MLB Triple Crown Winners". Baseball-Reference.com. Retrieved April 21, 2013. ^ a b c d "Cardinals timeline 1". St. Louis Cardinals Official Website. Retrieved March 6, 2007. ^ "Baltimore Orioles on Baseball Almanac". Baseball-almanac.com. Retrieved June 3, 2013. ^ Macht, Norman. "The Ballplayers – Sam Breadon". BaseballLibrary.com. Archived from the original on December 2, 2013. Retrieved June 3, 2013. ^ Doyle, Pat. "Branch Rickey's Farm – Minor League History". baseball-almanac.com. Retrieved June 3, 2013. ^ "On This Day: Branch Rickey, 83, dies in Missouri". New York Times on the Web Learning Network. January 10, 1965. Retrieved January 24, 2013. ^ "Rogers Hornsby player page". Baseball-Reference.com. Retrieved April 21, 2013. ^ a b c "Cardinals timeline 3". St. Louis Cardinals Official Website. Retrieved February 22, 2013. ^ "Dizzy Dean player page". Baseball-Reference.com. Retrieved February 22, 2013. ^ "St. Louis Cardinals HOF Museum". MLB.com. Retrieved February 23, 2013. ^ "Johnny Mize player page". Baseball-Reference.com. Retrieved April 21, 2013. ^ "Joe Medwick player page". Baseball-Reference.com. Retrieved April 21, 2013. ^ "Marty Marion player page". Baseball-Reference.com. Retrieved April 21, 2013. ^ "Enos Slaughter player page". Baseball-Reference.com. Retrieved April 21, 2013. ^ "Mort Cooper player page". Baseball-Reference.com. Retrieved April 21, 2013. ^ "Walker Cooper player page". Baseball-Reference.com. Retrieved April 21, 2013. ^ a b "Stan Musial player page". Baseball-Reference.com. Retrieved April 21, 2013. ^ "Max Lanier player page". Baseball-Reference.com. Retrieved April 21, 2013. ^ "Whitey Kurowski player page". Baseball-Reference.com. Retrieved April 21, 2013. ^ "Red Schoendienst player page". Baseball-Reference.com. Retrieved April 21, 2013. ^ "Johnny Beazley player page". Baseball-Reference.com. Retrieved April 21, 2013. ^ "Breakout selected from 1940 to 1949". Baseball-Reference.com. Retrieved October 6, 2013. ^ "Billy Southworth". Society for American Baseball Research. Retrieved February 23, 2013. ^ a b "Billy Southworth Managerial Record". Baseball-Reference.com. Retrieved March 26, 2013. ^ Fallstrom, A.B. (January 20, 2013). "Cardinals Hall of Famer Stan Musial Dies at 92". ABC News. Retrieved January 24, 2013. ^ Schwartz, Larry (October 17, 2005). "Slaughter's mad dash gives Cardinals the title". ESPN Classic. Retrieved January 24, 2013. ^ a b c "Cardinals timeline 4". St. Louis Cardinals Official Website. Retrieved May 15, 2007. ^ "Bob Gibson player page". Baseball-Reference.com. Retrieved May 15, 2013. ^ "August Anheuser Busch Was Born". America's Library. July 30, 2011. Retrieved April 4, 2013. ^ "August Anheuser Busch Was Born". Sports Encyclopedia. April 23, 2008. Retrieved April 4, 2013. ^ "MLB Trade Deadline Can Be Great Deal of Trouble". New York Times. July 30, 2011. Retrieved April 4, 2013. ^ Newhan, Ross (January 20, 2008). "1964 St. Louis Cardinals". Scout.com. Archived from the original on June 22, 2013. Retrieved April 5, 2013. ^ "Bill White player page". Baseball-Reference.com. Retrieved May 15, 2013. ^ "Steve Carlton player page". Baseball-Reference.com. Retrieved May 16, 2013. ^ "Curt Flood player page". Baseball-Reference.com. Retrieved May 15, 2013. ^ "Curt Simmons player page". Baseball-Reference.com. Retrieved May 15, 2013. ^ "Orlando Cepeda player page". Baseball-Reference.com. Retrieved May 15, 2013. ^ "1967 World Series". MLB.com. Retrieved May 15, 2013. ^ "1968 Major League Baseball Season Summary". Baseball-Reference.com. Retrieved April 5, 2013. ^ "World Series History: 1968 World Series". MLB.com. Retrieved April 5, 2013. ^ "1968: The Year of the Pitcher". SI.com. August 4, 1998. ^ "Joe Torre player page". Baseball-Reference.com. Retrieved April 24, 2013. ^ "Keith Hernández player page". Baseball-Reference.com. Retrieved April 24, 2013. ^ a b "Whitey Herzog Managerial Record". Baseball-Reference.com. Retrieved March 26, 2013. ^ Donovan, John (July 28, 2002). "Calling the Wizard". SI.com. Archived from the original on October 22, 2012. Retrieved May 14, 2013. ^ "Ozzie Smith player page". Baseball-Reference.com. Retrieved April 24, 2013. ^ "1982 World Series". Baseball-Reference.com. Retrieved May 14, 2013. ^ "Vintage Gallery: Memories of the last 'Suds Series". pjstar.com. October 11, 2011. Archived from the original on December 9, 2011. Retrieved May 15, 2013. ^ "1987 St. Louis Cardinals Batting, Pitching & Fielding statistics". Baseball-Reference.com. Retrieved May 14, 2013. ^ "1985 World Series". Baseball-Reference.com. Retrieved May 14, 2013. ^ a b "Chris Carpenter player page". Baseball-Reference.com. March 31, 2013. ^ Cart, Julie (September 30, 1989). "Patriarch of Cardinals Is Dead at 90: August A. Busch, Jr., Beer Baron, Bought Baseball Team in '53". LA Times. Retrieved March 31, 2013. ^ "Anheuser-Busch Looking to Sell Cardinals". The Daily Reporter. October 26, 1995. Retrieved March 31, 2013. ^ a b "Joe Torre Managerial Record". Baseball-Reference.com. Retrieved March 26, 2013. ^ "AB Sell Cardinals". New York Times. December 23, 1995. Retrieved February 24, 2013. ^ "Tony La Russa retires as manager, three days after winning World Series". NJ.com (Associated Press). October 31, 2011. Retrieved February 24, 2013. ^ "Mark McGwire's Seventy Home Run Season by Baseball Almanac". Archived from the original on August 17, 2007. Retrieved August 8, 2007. ^ "Breakout selected from 2000 to 2013". Sports Reference LLC. Retrieved October 6, 2013. ^ Goold, Derrick (December 24, 2011). "Cardinals recast the 'MV3'". stltoday.com. Retrieved June 3, 2012. ^ "Albert Pujols player page". Baseball-Reference.com. March 31, 2013. ^ "2004 St. Louis Cardinals team page". Baseball-Reference.com. March 31, 2013. ^ Morris, Patrick (February 6, 2008). "Cardinals win like never before". Los Angeles Times. Retrieved March 31, 2013. ^ "Top 10 Unlikely World Series Winners". RealClearSports. October 25, 2012. Retrieved March 31, 2013. ^ "Cardinals timeline: 2000s". St. Louis Cardinals Official Website. Retrieved January 14, 2008. ^ "2006 St. Louis Cardinals team page". Baseball-Reference.com. March 31, 2013. ^ "American Association Remembered". MLB.com. May 7, 2007. Retrieved March 28, 2013. ^ "The St. Louis Cardinals' Greatest Moments". Back to Baseball. July 24, 2012. Retrieved March 28, 2013. ^ Miklasz, Bernie (October 29, 2011). "Cardinals win like never before". St Louis Post-Dispatch. Retrieved October 29, 2011. ^ Strauss, Joe (October 22, 2011). "Pujols puts on historic display of power". St. Louis Post-Dispatch. Retrieved August 5, 2011. ^ DiComo, Anthony (October 28, 2011). "'Unbelievable' Game 6 ranks among the best". MLB.com. Retrieved November 1, 2012. ^ Jenkins, Bruce (October 12, 2012). "Cardinals carry on winning tradition". San Francisco Chronicle. Retrieved November 5, 2012. ^ "Cardinals to retire Tony La Russa's No. 10 jersey". USATODAY.com (AP). May 1, 2012. Retrieved May 3, 2012. ^ Cardinals Press Release (November 20, 2013). "Cardinals announce extension for Matheny". cleveland.indians.mlb.com. Retrieved March 6, 2014. ^ Goold, Derrick. "Cards in disbelief over Taveras' death". ^ Schmidt, Michael (June 16, 2015). "Cardinals Face F.B.I. Inquiry in Hacking of Astros' Database". Retrieved June 16, 2015. ^ "Cardinals bringing back blue jerseys". KSDK. Retrieved 2018-11-19. ^ "Busch Stadium Information – Directions". cardinals.com. Retrieved May 27, 2013. ^ "Busch Stadium". ballparks.com. Retrieved May 27, 2013. ^ Spector, Jesse (November 5, 2009). "27 things about those 27 New York Yankees World Series titles". New York Daily News. ^ "Park Factors for Busch Stadium, St. Louis". parkfactors.com. Retrieved May 27, 2013. ^ Hoffert, Jess. "Busch Stadium". midwestliving.com. Retrieved May 27, 2013. ^ Kim, Roland (September 5, 2012). "Watching a Cardinals Game at Busch Stadium". Yahoo! Voices. Archived from the original on July 28, 2014. ^ Granillo, Larry (February 3, 2010). "Baseball's Best Statues, by Ballpark". wezen-ball.com. ^ Snyder, Matt (May 24, 2013). "PHOTO: Busch Stadium as a soccer venue". CBSSports.com. Retrieved May 27, 2013. ^ Volkmann, Kelsey (July 18, 2011). "U2 rocks Busch Stadium in St. Louis". St. Louis Business Journal. Retrieved May 27, 2013. ^ "Busch Stadium Ballpark Village Information". cardinals.com. Retrieved April 6, 2014. ^ "St. Louis Cardinals Attendance, Stadiums, and Park Factors". Baseball-Reference.com. Retrieved May 5, 2018. ^ Getzenburg, Alaina (September 18, 2017). "Schmidt's vision inspired iconic red bird logo". MLB Advanced Media. Retrieved April 19, 2018. ^ a b c "Cardinals uniforms". Baseball Hall of Fame Uniform Database. Retrieved May 3, 2008. ^ Langosch, Jenifer (November 16, 2012). "City is key to Cardinals' alternate home jersey". MLB Advanced Media. Archived from the original on November 19, 2012. Retrieved April 19, 2018. ^ Clair, Michael (November 19, 2018). "The Cardinals brought back the powder blue jerseys with -- get this -- buttons!". MLB Advanced Media. Retrieved November 20, 2018. ^ Britt, Crystal (October 7, 2011). "Fans hope Buschie the Rally Squirrel is good luck – KFVS12 News & Weather Cape Girardeau, Carbondale, Poplar Bluff". Kfvs12.com. Retrieved December 13, 2012. ^ "In defense of DeWit & Company". Scout.com. December 24, 2008. Archived from the original on June 22, 2013. Retrieved April 27, 2013. ^ a b "Baseball's Sign of the Times: Under New Ownership". Chicago Tribune. December 26, 1995. Retrieved April 27, 2013. ^ a b "Anheuser-Busch Puts Cardinals Up for Sale". Eugene Register-Guard. October 26, 1995. Retrieved April 27, 2013. ^ "Cards owners worth $4 billion". St. Louis Business Journal. May 6, 2001. Retrieved April 27, 2013. ^ "Cardinals group to buy up departing owners' stakes". St. Louis Business Journal. November 20, 2005. Retrieved April 26, 2013. ^ "DeWitt III defends Cardinals; releases owner names". St. Louis Business Journal. December 7, 2010. Retrieved April 27, 2013. ^ Mike Ozanian (April 11, 2017). "Baseball Team Values 2017". Forbes. ^ Mike Ozanian (March 23, 2016). "Baseball's Most Valuable Teams". Forbes. ^ a b "St. Louis Cardinals – in photos: MLB valuations". Forbes. March 26, 2014. Retrieved March 30, 2014. ^ a b c "#10 St. Louis Cardinals". Forbes. March 26, 2013. Retrieved March 30, 2014. ^ "St. Louis Cardinals, LLC". Privco. March 26, 2013. Retrieved March 27, 2013. ^ "Baseball Team Values 2018". Forbes. April 11, 2018. ^ "#8 St. Louis Cardinals". Forbes. April 7, 2010. Retrieved November 14, 2011. ^ "#11 St. Louis Cardinals". Forbes. March 23, 2011. Retrieved November 14, 2011. ^ "#11 St. Louis Cardinals". Forbes. March 21, 2012. Retrieved March 22, 2012. ^ a b "St. Louis Cardinals on the Forbes MLB team valuations list". Forbes. Retrieved March 30, 2014. ^ "St. Louis Cardinals on the Forbes MLB team valuations list". Forbes. Retrieved July 10, 2015. ^ a b "St. Louis Cardinals". Forbes. April 11, 2017. ^ "First phase of Ballpark Village opens". MLB.com. March 27, 2014. ^ "Finally! Ballpark Village announces its grand opening lineup". St. Louis Post-Dispatch. March 6, 2014. ^ "Ballpark Village at Busch a smashing success". MLB.com. April 7, 2014. ^ a b c Hummel, Rick (November 16, 2013). "Cardinals buy Memphis franchise". St. Louis Post-Dispatch. Retrieved November 16, 2013. ^ "Chris Von der Ahe Managerial Record". Baseball-Reference.com. Retrieved March 26, 2013. ^ "Patsy Donovan Managerial Record". Baseball-Reference.com. Retrieved March 26, 2013. ^ "Kid Nichols Managerial Record". Baseball-Reference.com. Retrieved July 18, 2018. ^ "John McCloskey Managerial Record". Baseball-Reference.com. Retrieved March 26, 2013. ^ "Roger Bresnahan Managerial Record". Baseball-Reference.com. Retrieved March 26, 2013. ^ "Miller Huggins Managerial Record". Baseball-Reference.com. Retrieved March 26, 2013. ^ "Jack Hendricks Managerial Record". Baseball-Reference.com. Retrieved July 18, 2018. ^ "Branch Rickey Managerial Record". Baseball-Reference.com. Retrieved March 26, 2013. ^ "Rogers Hornsby Managerial Record". Baseball-Reference.com. Retrieved October 3, 2017. ^ "Bob O'Farrell Managerial Record". Baseball-Reference.com. Retrieved July 18, 2018. ^ "Bill McKechnie Managerial Record". Baseball-Reference.com. Retrieved October 3, 2017. ^ "Gabby Street Managerial Record". Baseball-Reference.com. Retrieved March 26, 2013. ^ "Frankie Frisch Managerial Record". Baseball-Reference.com. Retrieved March 26, 2013. ^ "Ray Blades Managerial Record". Baseball-Reference.com. Retrieved October 3, 2017. ^ "Eddie Dyer Managerial Record". Baseball-Reference.com. Retrieved March 26, 2013. ^ "Marty Marion Managerial Record". Baseball-Reference.com. Retrieved July 18, 2018. ^ "Eddie Stanky Managerial Record". Baseball-Reference.com. Retrieved March 26, 2013. ^ "Fred Hutchinson Managerial Record". Baseball-Reference.com. Retrieved October 6, 2014. ^ "Solly Hemus Managerial Record". Baseball-Reference.com. Retrieved October 6, 2014. ^ "Johhny Keane Managerial Record". Baseball-Reference.com. Retrieved March 26, 2013. ^ "Red Schoendienst Managerial Record". Baseball-Reference.com. Retrieved March 26, 2013. ^ "Vern Rapp Managerial Record". Baseball-Reference.com. Retrieved July 18, 2018. ^ "Ken Boyer Managerial Record". Baseball-Reference.com. Retrieved October 6, 2014. ^ "Tony LaRussa Managerial Record". Baseball-Reference.com. Retrieved March 26, 2013. ^ "Cardinals fire manager Mike Matheny". St. Louis Post-Dispatch. July 14, 2018. ^ "Mike Matheny Managerial Record". Baseball-Reference.com. Retrieved October 2, 2017. ^ "Mike Shildt Managerial Record". Baseball-Reference.com. Retrieved July 18, 2018. ^ "Darryl Kile Award". Baseball-almanac.com. Retrieved December 13, 2012. ^ "St. Louis Cardinals". Baseball-almanac.com. Retrieved October 29, 2011. ^ "Triple Crown Winners". Baseball-Reference.com. Retrieved October 29, 2011. ^ "RBI records". Baseball-almanac.com. Retrieved October 29, 2011. ^ "Box score for Bottomley". Retrosheet.org. September 16, 1924. Retrieved October 29, 2011. ^ "Home run records". Baseball-almanac.com. Retrieved October 29, 2011. ^ "Box score". Retrosheet.org. September 7, 1993. Retrieved October 29, 2011. ^ "Baseball Almanac". Baseball Almanac. Retrieved October 29, 2011. ^ "Cardinals establish Hall of Fame & detail induction process" (Press release). St. Louis Cardinals. January 18, 2014. Archived from the original on January 26, 2014. Retrieved January 29, 2014. ^ "Cardinals retired numbers". stlouis.cardinals.mlb.com. Retrieved July 20, 2013. ^ Kiley, Gabriel (July 12, 2012). "A look at the Cardinals retired numbers". stlouis.cardinals.mlb.com. Retrieved July 20, 2013. ^ Araton, Harvey (April 14, 2010). "Yankees' Mariano Rivera is the last No. 42". New York Times. ^ Goold, Derrick (February 6, 2013). "Cards issue No. 32 for first time since Hancock wore it". St. Louis Post-Dispatch. Retrieved February 7, 2013. ^ "Shannon will do fewer Cards games in 2013". St. Louis Post-Dispatch. March 22, 2013. Retrieved March 28, 2013. ^ "Edmonds joins Fox Sports Midwest". Fox Sports Midwest.com. March 14, 2013. Retrieved April 22, 2013. ^ "About Cardinals Kids". Cardinals Kids.com. 2013. Retrieved April 22, 2013. ^ "St. Louis Cardinals at Milwaukee Brewers Box Score, March 28, 2019". Baseball-Reference.com. March 28, 2019. ^ "St. Louis Cardinals at New York Mets Box Score, March 29, 2018". Baseball-Reference.com. March 29, 2018. ^ "Box Score of Game played on Sunday, April 2, 2017 at Busch Stadium III". Baseball-almanac.com. April 2, 2017. Retrieved December 27, 2017. ^ "Box Score of Game played on Sunday, April 3, 2016 at PNC Park". Baseball-almanac.com. April 3, 2016. Retrieved December 27, 2017. ^ "Box Score of Game played on Sunday, April 5, 2015 at Wrigley Field". Baseball-almanac.com. April 5, 2015. Retrieved December 27, 2017. ^ "Box Score of Game played on Monday, March 31, 2014 at Great American Ball Park". Baseball-almanac.com. March 31, 2014. Retrieved December 27, 2017. ^ "Box Score of Game played on Monday, April 1, 2013 at Chase Field". Baseball-almanac.com. April 1, 2013. Retrieved December 27, 2017. ^ "Box Score of Game played on Wednesday, April 4, 2012 at Marlins Park". Baseball-almanac.com. April 4, 2012. Retrieved December 27, 2017. ^ "Box Score of Game played on Thursday, March 31, 2011 at Busch Stadium III". Baseball-almanac.com. March 31, 2011. Retrieved December 27, 2017. ^ "Box Score of Game played on Monday, April 5, 2010 at Great American Ball Park". Baseball-almanac.com. April 5, 2010. Retrieved December 27, 2017. ^ "Box Score of Game played on Monday, April 6, 2009 at Busch Stadium III". Baseball-almanac.com. April 6, 2009. Retrieved December 27, 2017. ^ "Box Score of Game played on Tuesday, April 1, 2008 at Busch Stadium III". Baseball-almanac.com. April 1, 2008. Retrieved December 27, 2017. ^ "Box Score of Game played on Sunday, April 1, 2007 at Busch Stadium III". Baseball-almanac.com. April 1, 2007. Retrieved December 27, 2017. ^ "Box Score of Game played on Monday, April 3, 2006 at Citizens Bank Park". Baseball-almanac.com. April 3, 2006. Retrieved December 27, 2017. ^ "Box Score of Game played on Tuesday, April 5, 2005 at Minute Maid Park". Baseball-almanac.com. April 5, 2005. Retrieved December 27, 2017. ^ "Box Score of Game played on Monday, April 5, 2004 at Busch Stadium II". Baseball-almanac.com. April 5, 2003. Retrieved December 27, 2017. ^ "Box Score of Game played on Monday, March 31, 2003 at Busch Stadium II". Baseball-almanac.com. March 31, 2003. Retrieved December 27, 2017. ^ "Box Score of Game played on Monday, April 1, 2002 at Busch Stadium II". Baseball-almanac.com. April 1, 2002. Retrieved December 27, 2017. ^ "Box Score of Game played on Monday, April 2, 2001 at Coors Field". Baseball-almanac.com. April 2, 2001. Retrieved December 27, 2017. ^ "Box Score of Game played on Monday, April 3, 2000 at Busch Stadium II". Baseball-almanac.com. April 3, 2000. Retrieved December 27, 2017. ^ "Box Score of Game played on Monday, April 5, 1999 at Busch Stadium II". Baseball-almanac.com. April 5, 1999. Retrieved December 27, 2017. ^ "Box Score of Game played on Tuesday, March 31, 1998 at Busch Stadium II". Baseball-almanac.com. March 31, 1998. Retrieved December 27, 2017. ^ "Box Score of Game played on Tuesday, April 1, 1997 at Stade Olympique". Baseball-almanac.com. April 1, 1997. Retrieved December 27, 2017. ^ "Box Score of Game played on Monday, April 1, 1996 at Shea Stadium". Baseball-almanac.com. April 1, 1996. Retrieved December 27, 2017. ^ "Box Score of Game played on Wednesday, April 26, 1995 at Busch Stadium II". Baseball-almanac.com. April 26, 1995. Retrieved December 27, 2017. ^ "Box Score of Game played on Sunday, April 3, 1994 at Riverfront Stadium". Baseball-almanac.com. April 3, 1994. Retrieved December 27, 2017. ^ "Box Score of Game played on Sunday, April 6, 1993 at Busch Stadium II". Baseball-almanac.com. April 6, 1993. Retrieved December 27, 2017. ^ "Box Score of Game played on Monday, April 6, 1992 at Busch Stadium II". Baseball-almanac.com. April 6, 1992. Retrieved December 27, 2017. ^ "Box Score of Game played on Tuesday, April 9, 1991 at Wrigley Field". Baseball-almanac.com. April 9, 1991. Retrieved December 27, 2017. ^ "Box Score of Game played on Monday, April 9, 1990 at Busch Stadium II". Baseball-almanac.com. April 9, 1990. Retrieved December 27, 2017. ^ "Box Score of Game played on Monday, April 3, 1989 at Shea Stadium". Baseball-almanac.com. April 3, 1989. Retrieved December 27, 2017. ^ "Box Score of Game played on Monday, April 4, 1988 at Riverfront Stadium". Baseball-almanac.com. April 4, 1988. Retrieved December 27, 2017. ^ "Box Score of Game played on Tuesday, April 7, 1987 at Wrigley Field". Baseball-almanac.com. April 7, 1987. Retrieved December 27, 2017. ^ "Box Score of Game played on Tuesday, April 8, 1986 at Busch Stadium II". Baseball-almanac.com. April 8, 1986. Retrieved December 27, 2017. ^ "Box Score of Game played on Tuesday, April 9, 1985 at Shea Stadium". Baseball-almanac.com. April 9, 1985. Retrieved December 27, 2017. ^ "Box Score of Game played on Tuesday, April 3, 1984 at Dodger Stadium". Baseball-almanac.com. April 3, 1984. Retrieved December 27, 2017. ^ "Box Score of Game played on Tuesday, April 5, 1983 at Busch Stadium II". Baseball-almanac.com. April 5, 1983. Retrieved December 27, 2017. ^ "Box Score of Game played on Tuesday, April 6, 1982 at Astrodome". Baseball-almanac.com. April 6, 1982. Retrieved December 27, 2017. ^ "Box Score of Game played on Saturday, April 11, 1981 at Busch Stadium II". Baseball-almanac.com. April 11, 1981. Retrieved December 27, 2017. ^ "Box Score of Game played on Thursday, April 10, 1980 at Busch Stadium II". Baseball-almanac.com. April 10, 1980. Retrieved December 27, 2017. ^ "Box Score of Game played on Friday, April 6, 1979 at Busch Stadium II". Baseball-almanac.com. April 6, 1979. Retrieved December 27, 2017. ^ "Box Score of Game played on Friday, April 7, 1978 at Veteran's Stadium". Baseball-almanac.com. April 7, 1978. Retrieved December 27, 2017. ^ "Box Score of Game played on Thursday, April 7, 1977 at Three Rivers Stadium". Baseball-almanac.com. April 7, 1977. Retrieved December 27, 2017. ^ "Box Score of Game played on Friday, April 9, 1976 at Busch Stadium II". Baseball-almanac.com. April 9, 1976. Retrieved December 27, 2017. ^ "Box Score of Game played on Monday, April 7, 1975 at Busch Stadium II". Baseball-almanac.com. April 7, 1975. Retrieved December 27, 2017. ^ "Box Score of Game played on Friday, April 5, 1974 at Busch Stadium II". Baseball-almanac.com. April 5, 1974. Retrieved December 27, 2017. ^ "Box Score of Game played on Friday, April 6, 1973 at Three Rivers Stadium". Baseball-almanac.com. April 6, 1973. Retrieved December 27, 2017. ^ "Box Score of Game played on Saturday, April 15, 1972 at Busch Stadium II". Baseball-almanac.com. April 15, 1972. Retrieved December 27, 2017. ^ "Box Score of Game played on Tuesday, April 6, 1971 at Wrigley Field". Baseball-almanac.com. April 6, 1971. Retrieved December 27, 2017. ^ "Box Score of Game played on Wednesday, April 8, 1970 at Parc Jarry". Baseball-almanac.com. April 8, 1970. Retrieved December 27, 2017. ^ "Box Score of Game played on Tuesday, April 8, 1969 at Busch Stadium II". Baseball-almanac.com. April 8, 1969. Retrieved December 27, 2017. ^ "Box Score of Game played on Wednesday, April 10, 1968 at Busch Stadium II". Baseball-almanac.com. April 10, 1968. Retrieved December 27, 2017. ^ "Box Score of Game played on Tuesday, April 11, 1967 at Busch Stadium II". Baseball-almanac.com. April 11, 1967. Retrieved December 27, 2017. ^ "Box Score of Game played on Wednesday, April 13, 1966 at Busch Stadium I". Baseball-almanac.com. April 13, 1966. Retrieved December 27, 2017. ^ "Box Score of Game played on Monday, April 12, 1965 at Wrigley Field". Baseball-almanac.com. April 12, 1965. Retrieved December 27, 2017. ^ "Box Score of Game played on Tuesday, April 14, 1964 at Dodger Stadium". Baseball-almanac.com. April 14, 1964. Retrieved December 27, 2017. ^ "Box Score of Game played on Tuesday, April 9, 1963 at Polo Grounds V". Baseball-almanac.com. April 9, 1963. Retrieved December 27, 2017. ^ "Box Score of Game played on Wednesday, April 11, 1962 at Busch Stadium I". Baseball-almanac.com. April 11, 1962. Retrieved December 27, 2017. ^ "Box Score of Game played on Thursday, April 11, 1961 at County Stadium". Baseball-almanac.com. April 11, 1961. Retrieved December 27, 2017. ^ "Box Score of Game played on Tuesday, April 12, 1960 at Candlestick Park". Baseball-almanac.com. April 12, 1960. Retrieved December 27, 2017. ^ "Box Score of Game played on Friday, April 10, 1959 at Busch Stadium I". Baseball-almanac.com. April 10, 1959. Retrieved December 27, 2017. ^ "Box Score of Game played on Tuesday, April 15, 1958 at Busch Stadium I". Baseball-almanac.com. April 15, 1958. Retrieved December 27, 2017. ^ "Box Score of Game played on Tuesday, April 16, 1957 at Crosley Field". Baseball-almanac.com. April 16, 1957. Retrieved December 27, 2017. ^ "Box Score of Game played on Tuesday, April 17, 1956 at Crosley Field". Baseball-almanac.com. April 17, 1956. Retrieved December 27, 2017. ^ "Box Score of Game played on Tuesday, April 12, 1955 at Wrigley Field". Baseball-almanac.com. April 12, 1955. Retrieved December 27, 2017. ^ "Box Score of Game played on Tuesday, April 13, 1954 at Busch Stadium I". Baseball-almanac.com. April 13, 1954. Retrieved December 27, 2017. ^ "Box Score of Game played on Tuesday, April 14, 1953 at County Stadium". Baseball-almanac.com. April 14, 1953. Retrieved December 27, 2017. ^ "Box Score of Game played on Tuesday, April 15, 1952 at Sportsman's Park III". Baseball-almanac.com. April 15, 1952. Retrieved December 27, 2017. ^ "Box Score of Game played on Tuesday, April 17, 1951 at Forbes Field". Baseball-almanac.com. April 17, 1951. Retrieved December 27, 2017. ^ "Box Score of Game played on Tuesday, April 18, 1950 at Sportsman's Park III". Baseball-almanac.com. April 18, 1950. Retrieved December 27, 2017. ^ "Box Score of Game played on Tuesday, April 19, 1949 at Crosley Field". Baseball-almanac.com. April 19, 1949. Retrieved December 27, 2017. ^ "Box Score of Game played on Tuesday, April 20, 1948 at Sportsman's Park III". Baseball-almanac.com. April 20, 1948. Retrieved December 27, 2017. ^ "Box Score of Game played on Tuesday, April 15, 1947 at Crosley Field". Baseball-almanac.com. April 15, 1947. Retrieved December 27, 2017. ^ "Box Score of Game played on Tuesday, April 16, 1946 at Sportsman's Park III". Baseball-almanac.com. April 16, 1946. Retrieved December 27, 2017. ^ "Box Score of Game played on Tuesday, April 17, 1945 at Wrigley Field". Baseball-almanac.com. April 17, 1945. Retrieved December 27, 2017. ^ "Box Score of Game played on Tuesday, April 18, 1944 at Sportsman's Park III". Baseball-almanac.com. April 18, 1944. Retrieved December 27, 2017. ^ "Box Score of Game played on Wednesday, April 21, 1943 at Crosley Field". Baseball-almanac.com. April 21, 1943. Retrieved December 27, 2017. ^ "Box Score of Game played on Tuesday, April 14, 1942 at Sportsman's Park III". Baseball-almanac.com. April 14, 1942. Retrieved December 27, 2017. ^ "Box Score of Game played on Tuesday, April 15, 1941 at Crosley Field". Baseball-almanac.com. April 15, 1941. Retrieved December 27, 2017. ^ "Box Score of Game played on Tuesday, April 16, 1940 at Sportsman's Park III". Baseball-almanac.com. April 16, 1940. Retrieved December 27, 2017. ^ "Box Score of Game played on Tuesday, April 18, 1939 at Forbes Field". Baseball-almanac.com. April 18, 1939. Retrieved December 27, 2017. ^ "Box Score of Game played on Tuesday, April 19, 1938 at Sportsman's Park III". Baseball-almanac.com. April 19, 1938. Retrieved December 27, 2017. ^ "Box Score of Game played on Tuesday, April 20, 1937 at Crosley Field". Baseball-almanac.com. April 20, 1937. Retrieved December 27, 2017. ^ "Box Score of Game played on Tuesday, April 14, 1936 at Sportsman's Park III". Baseball-almanac.com. April 14, 1936. Retrieved December 27, 2017. ^ "Box Score of Game played on Tuesday, April 16, 1935 at Wrigley Field". Baseball-almanac.com. April 16, 1935. Retrieved December 27, 2017. ^ "Box Score of Game played on Tuesday, April 17, 1934 at Sportsman's Park III". Baseball-almanac.com. April 17, 1934. Retrieved December 27, 2017. ^ "Box Score of Game played on Wednesday, April 12, 1933 at Wrigley Field". Baseball-almanac.com. April 12, 1933. Retrieved December 27, 2017. ^ "Box Score of Game played on Tuesday, April 12, 1932 at Sportsman's Park III". Baseball-almanac.com. April 12, 1932. Retrieved December 27, 2017. ^ "Box Score of Game played on Tuesday, April 14, 1931 at Redland Field". Baseball-almanac.com. April 14, 1931. Retrieved December 27, 2017. ^ "Box Score of Game played on Tuesday, April 15, 1930 at Sportsman's Park III". Baseball-almanac.com. April 15, 1930. Retrieved December 27, 2017. ^ "Box Score of Game played on Tuesday, April 16, 1929 at Redland Field". Baseball-almanac.com. April 16, 1929. Retrieved December 27, 2017. ^ "Box Score of Game played on Wednesday, April 11, 1928 at Sportsman's Park III". Baseball-almanac.com. April 11, 1928. Retrieved December 27, 2017. ^ "Box Score of Game played on Tuesday, April 12, 1927 at Wrigley Field". Baseball-almanac.com. April 12, 1927. Retrieved December 27, 2017. ^ "Box Score of Game played on Tuesday, April 13, 1926 at Sportsman's Park III". Baseball-almanac.com. April 13, 1926. Retrieved December 27, 2017. ^ "Box Score of Game played on Tuesday, April 14, 1925 at Redland Field". Baseball-almanac.com. April 14, 1925. Retrieved December 27, 2017. ^ "Box Score of Game played on Tuesday, April 15, 1924 at Sportsman's Park III". Baseball-almanac.com. April 15, 1924. Retrieved December 27, 2017. ^ "Box Score of Game played on Tuesday, April 17, 1923 at Redland Field". Baseball-almanac.com. April 17, 1923. Retrieved December 27, 2017. ^ "Box Score of Game played on Wednesday, April 12, 1922 at Sportsman's Park III". Baseball-almanac.com. April 12, 1922. Retrieved December 27, 2017. ^ "Box Score of Game played on Wednesday, April 13, 1921 at Cubs Park". Baseball-almanac.com. April 13, 1921. Retrieved December 27, 2017. ^ "Box Score of Game played on Wednesday, April 14, 1920 at Robison Field". Baseball-almanac.com. April 14, 1920. Retrieved December 27, 2017. ^ "Box Score of Game played on Wednesday, April 23, 1919 at Redland Field". Baseball-almanac.com. April 23, 1919. Retrieved December 27, 2017. ^ "Box Score of Game played on Tuesday, April 16, 1918 at Robison Field". Baseball-almanac.com. April 16, 1918. Retrieved December 27, 2017. ^ "Box Score of Game played on Wednesday, April 11, 1917 at Redland Field". Baseball-almanac.com. April 11, 1917. Retrieved December 27, 2017. ^ "Box Score of Game played on Wednesday, April 12, 1916 at Robison Field". Baseball-almanac.com. April 12, 1916. Retrieved December 27, 2017. ^ "Box Score of Game played on Wednesday, April 14, 1915 at West Side Grounds". Baseball-almanac.com. April 14, 1915. Retrieved December 27, 2017. ^ "Box Score of Game played on Tuesday, April 14, 1914 at Robison Field". Baseball-almanac.com. April 14, 1914. Retrieved December 27, 2017. ^ "Box Score of Game played on Saturday, April 12, 1913 at West Side Grounds". Baseball-almanac.com. April 12, 1913. Retrieved December 27, 2017. ^ "Cot's Baseball Contracts". Baseballprospectus.com. Retrieved March 30, 2018. Taylor, Phil (October 31, 2011). "Where's The Boo In Booster?". Sports Illustrated. Retrieved October 28, 2011. Redbird Nation's reputation as the most knowledgeable, loyal and, above all, friendly fans in the majors ... 'Our fans are the best because they're just as passionate as anywhere else, ..., but they're probably a little more fair-minded,' says St. Louis manager Tony La Russa. Weintraub, Robert (2013). The Victory Season: The End of World War II and the Birth of Baseball's Golden Age. New York: Little, Brown & Company. ISBN 978-0-316-20591-7. Wikimedia Commons has media related to St. Louis Cardinals.